This October, Essential relaunches with brand new packaging, improved formula and a new variant! Thanks SampleStore for sending me the whole range of Essential Moisturizing Frizz Free! 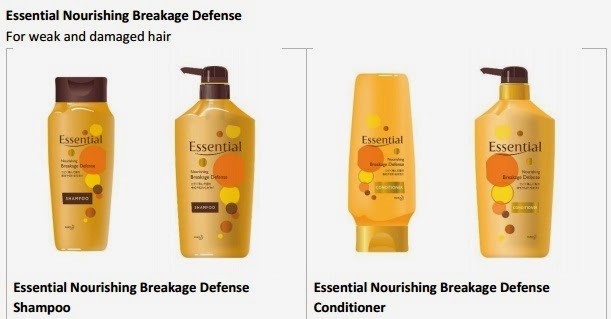 Essential haircare range has relaunched with new, improved formula and technology. people with combination hair – oily scalp/roots yet dry ends. from the same person is not uniform from root to tip. People with combination hair usually have oily roots and dry ends. Consumers are not familiar with the term ‘combination hair’ and no other haircare brand has talked about it. Essential wants to take this chance to educate consumers about this concept and bring to their attention that they may have this condition and new Essential is the solution to their problem. People with combination hair currently do not have one haircare product which they can use to solve both problems of oily roots and dry ends. Using a rich moisturizing product to care for their dry ends usually ends up having too much product buildup on their scalp, resulting in a heavy, oily scalp. Using a light, clarifying product to care for their oily scalp will then cause their ends to be even drier. As a result, people with combination hair will either have only one out of the two problems solved, or they have to rotate between using a rich moisturizing product and a light clarifying product to achieve a balance. New Essential Light Finish Volumizing (yellow) and Deep Cleansing Care (blue) variants have the optimum combination of Smart Cuticle Care & Sebum Cleansing Technology to target both problems of roots and hair ends. As a result, consumers experience the best of both worlds with one product – airy light roots and moisturized ends. Improved treatment now works its magic on your hair in 30 seconds! The result – deeply moisturized and manageable hair. Perfect for busy days. For more intensive treatment to treat those dry/damaged ends, leaving hair softer, smoother and more manageable. You can redeem free samples at http://on.fb.me/1pkXmPr. hypermarkets, western pharmacies and personal care stores.